How things had changed by 1992. Dance music was so acceptable in the mainstream 25 years ago this week that a local club track had recently reached number 1, while a techno anthem was sitting pretty in the top 5. Joining both those hits on the top 50 was another Dutch techno duo's debut single, and the latest fusion of dance beats and Indigenous music to grace the ARIA chart. At the top of the chart this week in 1992, rock reasserted itself as Red Hot Chili Peppers stepped up to number 1 with "Under The Bridge". The world music star made her only ARIA top 100 appearance with this track from her major label debut, Logozo, which remains her highest charting album in Australia. Previous single "Reverence" had been banned in the UK (and promptly hit the top 10 there), but this follow-up was a pretty straightforward indie track, which finally gave The Jesus And Mary Chain their first top 100 placing. We saw "Faith (In The Power Of Love)" as a breaker last week - and it was swiftly followed into the top 100 by another under-performing track from club star Rozalla. Not quite as good as "Street Of Dreams", the latest from the actress/singer was consequently not as big a chart hit in either Australia or the US. Given their debut self-titled album had recently spent six weeks at number 1 and was still in the top 10 this week in 1992, there was little chance a fifth track from Baby Animals would set the singles chart alight. The song's concert music video was mirrored on the CD single, which contained live versions of the band's first three singles as bonus tracks. Their last studio album, Gold Afternoon Fix, had yielded their biggest hit on the ARIA chart in the form of 1990's "Metropolis", but The Church enjoyed limited commercial success with eighth album Priest=Aura and its lead single, "Ripple". Unconcerned with such things, the band consider the more experimental release to be their creative zenith. After three top 5 hits (four, if you include "Doctorin' The Tardis"), The KLF were no more, having announced their retirement in a blaze of glory at the 1992 BRIT Awards in February. All that was left was for their other UK smash, "What Time Is Love? 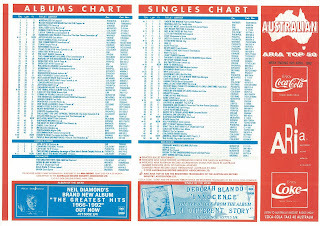 ", to finally become a hit in Australia - and it did so (just) in the form of the reworked "America: What Time Is Love?" Even heavier than the original, the updated version of the stadium house track incorporated everything from "Aquarius" to "Ace Of Spades", and featured vocal contributions from Deep Purple's Glenn Hughes in addition to a new rap from Isaac Bello. I much preferred the original, which never advanced further than number 73 despite two attempts in 1991. If it wasn't for the fact that he was coming of a number 1 single, I doubt this pleasant but kinda forgettable midtempo number by Julian Lennon would've got anywhere near the top 30. The title track of his latest album, "Help Yourself" would probably have benefitted from some beefed up production - as it was, it sounded a bit wishy-washy. At least the music video, in which Julian dressed up as various religious and spiritual characters, was fun. A month earlier, they won the ARIA Awards for Single Of The Year and Song of The Year - a distinction that no longer exists - for "Treaty (Filthy Lucre Mix)". This week, Yothu Yindi returned to the top 50 with another dance reworking of one of their songs. The original version of "Djäpana (Sunset Dreaming)" dated back to 1989's Homeland Movement album, from which it was released as a single with no success. Remixed by David Burnham, the song gave the Indigenous band another huge hit, which spent four non-consecutive weeks at its peak of number 13. The song was added to a repackaged Tribal Voice album - the original version would fall out of the chart next week and storm back into the top 20 at the end of May, with its new tracklisting seeing it go all the way to number 4. Where 2 Unlimited led, fellow Dutch techno act L.A. Style followed with their debut single, "James Brown Is Dead". The brainchild of DJ/producer Wessel Van Diepen, who'd go on to launch Vengaboys, and rapper FX (real name: Frans Merkx), L.A. Style weren't just big in Australia and Europe, they also made inroads into the US. Although "James Brown Is Dead" only reached number 59 there, it sold enough copies to go gold and stayed on the top 100 for 20 weeks - apparently the first techno track to do well in that market. Of course, the Godfather Of Soul wasn't deceased - he'd live until Christmas Day, 2006 - and the song's unique title prompted all manner of answer tracks, like the not-that-inventive "James Brown Is Still Alive". Shooting into the top 20 in its first week, "Skin To Skin" looked like it'd give soap star-turned-singer Melissa Tkautz her third top 5 smash. Once again co-written and co-produced by former Koo De Tah member Leon Berger, the song certainly sounded like another big hit. But then something unexpected happened - "Skin To Skin" went nowhere in its second week and then started dropping. 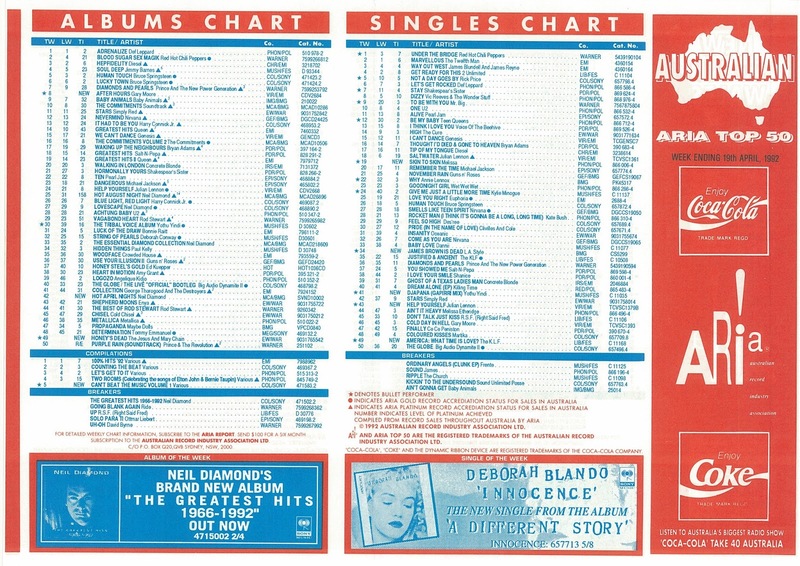 At the end of May, no doubt after some emergency extra promotion, it ended up reaching its ultimate peak of number 16, but it quickly fell back again. Melissa's debut album, Fresh, still wasn't out yet, so it can't have been because people were buying that. Had she been a little hasty in leaving E Street to concentrate on her music career? Next week: one Aussie girl group deserves another, with Teen Queens joined on the top 50 by a brand new flower hat-wearing five-piece. Plus, new hits from Prince, Metallica, Rockmelons and Midnight Oil. I knew a couple of later Angélique Kidjo singles, but not this one. 'Reverence' is more interesting than 'Far Gone and Out'. 'Head On' is my fave track of theirs I've heard. 'Are You Ready To Fly' is probably my favourite Rozalla single. I listened to the parent album recently, and it was surprisingly good. I liked 'Street of Dreams' but wasn't aware of this Nia Peeples track at the time... or now either, really, though I've listened to it on YouTube once before. I didn't really like any of the singles from the Baby Animals' debut, but liked some of the second album singles. I think I read something a few months back about Glenn Hughes crediting this KLF collaboration with re-gaining his sobriety, and/or still being alive. It's odd that 'James Brown Is Dead' wasn't a hit in the UK. 'Skin To Skin' was a bit sub-par and repetitive. A memorable letter published in Smash Hits stated that 'Skin To Skin' "wasn't a hit 'cause there were no hot guys in the video." It also went on to say that if Melissa wasn't careful, she'd be the next Collette instead of the next Kylie. A flower hat-wearing five piece? Uh-oh. Run!!! I agree with Nathan about "Skin To Skin", it was rather unmemorable. I also remember that letter in Smash Hits. Quite an astute individual who wrote it.